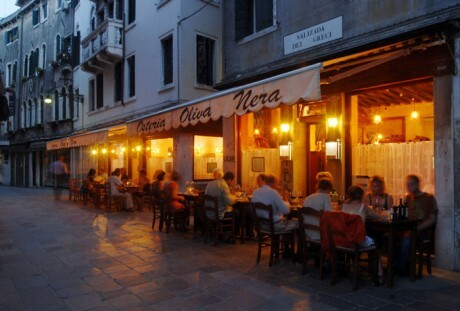 The next time you find yourself in Venice, think about splurging a little and have dinner at the wonderful Osteria Oliva Nera http://www.osteria-olivanera.com/. There are 2 restaurants, side-by-side, run by a husband and wife team, both rooms are very small, so reservations are highly recommended. Due to the fact that they are such small establishments, the service is very personalized – wait staff are attentive and knowledgeable, they won’t rush you and you are likely to be served, at least part of the time, by one of the owners. Our meals were absolutely delicious, obviously prepared with much care and the freshest ingredients. Be sure to try the lovely stuffed and fried zucchini flowers. I could Google this restaurant, but I was wondering if you could tell us what makes this particular restaurant worth a visit? What did you have, what was a standout, and what are they known to serve up? Everything was relatively simply prepared, allowing the freshness of the ingredients to shine through. I had the zuchinini flowers (stuffed with cheese & lightly fried), tomato & buffalo mozza salad & mixed seafood grill. The owners are more than happy to make suggestions from the menu and I think that’s the best way to get a feel for what’s good that day. The food was outstanding, but it was the amazing service and the atomosphere (elegant yet relaxing) that really makes this restaurant stand out. very poor value for money, we ordered a plate of tortellini. there were nine in a small plate … it’s a scam. He made us a tourist speech…. and keeps repeating the same, we have moved several times closed to his “restaurant” and heard the same speech every time! pathetic!